The LG Outdoor brand is part of the LeisureGrow business, and although it is relatively new to the production and supply of garden furniture, sets like the Saigon and Gold Coast LeisureGrow garden furniture represent high quality and durable furniture that also looks great. 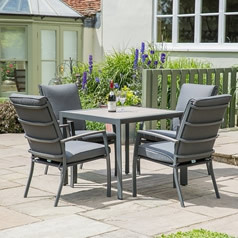 You can buy everything you need from table and chairs to loungers and accessories, or you can buy full LeisureGrow garden furniture sets, from Garden Furniture World. 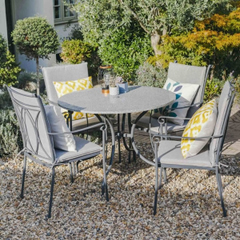 Enjoy competitive prices, secure online shopping, and access to products from some of the biggest brands in garden furniture. 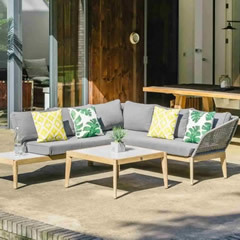 LeisureGrow garden furniture, also branded as LG Outdoor, offers the very latest in trends and fashions as part of its outdoor furniture range. As well as producing furniture that benefits from the latest design trends, they are also renowned for the manufacture of high quality, durable furniture that will last a lifetime and will continue to look great even after regular use. 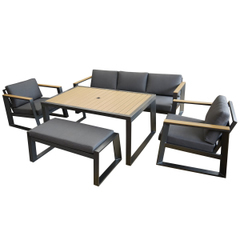 Weave - The LG Outdoor Saigon garden furniture collection is manufactured in Vietnam by experienced craftsmen. The hand woven furniture can be left out throughout the year, even during the cold and wet winter months, is combined with all-weather cushions to provide users with absolute comfort and luxury, as well as style. 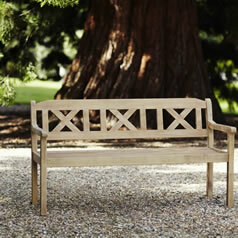 Wood - The wood collection is also manufactured in Vietnam, using Acacia wood. Some of the products also combine Saigon weave or rope, and this gives a natural and beautiful looking finish that is especially well suited to patio furniture. Wood furniture can be treated so it retains its new look, or it can be weathered so that it fits naturally into its outdoor surroundings. Ceramic - Bring a touch of Morocco and the Mediterranean into your garden, thanks to the ceramic collection of patio furniture. Ceramic tiles, warm colours, and robust frames, combine to give you a long-lasting and luxurious looking set of furniture. 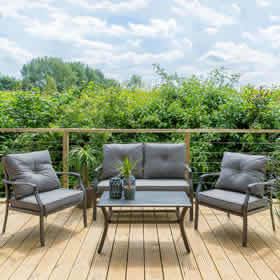 Metal - The metal collection of LeisureGrow garden furniture combines beautiful designs and shapes combined with cushioned seating and strong design. There are sets that offer traditional looking metal designs, as well as more contemporary styles, including the popular Gold Coast 8 seater, which offers plenty of room for large families or when you are entertaining. 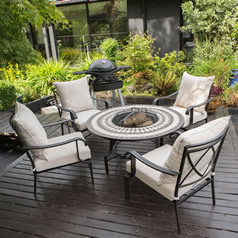 The LeisureGrow Casablanca fire pit set range includes a 4 seat lounge set or a 6 seat dining set. 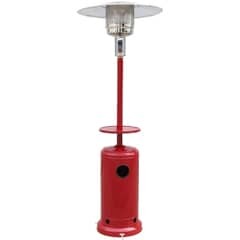 The table included in these sets incorporate a central charcoal firepit base, which can be used to offer instant heat or can even be used to cook over. Alternatively, a Lazy Susan can be added over the top of the charcoal pit section, allowing you to decide what feature you want from the table centre every time you sit down. 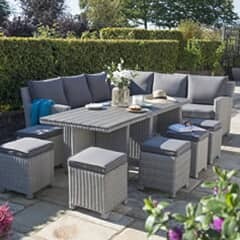 Accessories like ice buckets and fireguards are also included in these sets, and while the dining set includes 4 dining chairs, the lounge set offers an all-round experience, providing a convenient table with firepit and 4 comfortable lounge chairs. 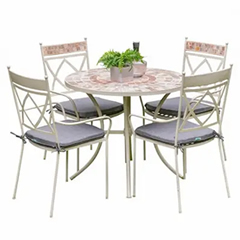 There are a number of Saigon sets, including the LeisureGrow Saigon Heritage includes a round glass-topped table and 6 seats. 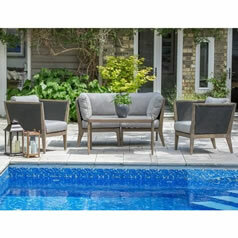 The Rustic and Colonial sets, as well as the Heritage set, include weatherproof cushions and they all feature the same high quality wicker weave. 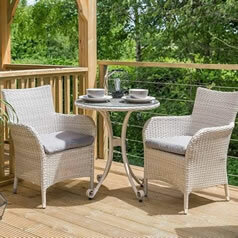 The weave offers greater comfort than the flat and solid wood or metal chairs often found in garden furniture, and wicker not only ages well, but has a look that is often improved after it has spent time in the garden or on the patio. The Rustic offers a combination of outdoor lounging furniture and dining table, and both the Heritage and Colonial sets offer comfortable dining and seating for friends and family. There are two main LeisureGrow Gold Coast 8 seater sets, both of which are made from durable and high quality metal. The aluminium frames are double powder coated to ensure durability and so that you can enjoy rust free metal frames for your patio furniture set. The tables are covered with reinforced safety glass, which means that you can comfortably fill them with food and drinks and not worry about the kids leaning on the table too heavily. Choose from a set that includes reclining lounger chairs, or one that has 8 dining chairs, and enjoy the same high quality regardless of which range you choose. The polyester canopy and PVC coated textilene ensure that the 3 seater sing set is weatherproof and durable, so it will last for years even if it is left out all year round. The swing set is perfect for those that don't have the storage room to put their furniture away in winter, but that want attractive and high quality furniture to enjoy during every month of the year. The steel frame is not only durable but it is strong and heavy, which means that the swing seat won't tip up when used. Most LG Outdoor garden furniture is designed from materials that can be left out throughout the year, even in winter. However, if you want to ensure that your furniture continues to look great and withstands even the harshest of conditions, you can buy covers for your furniture. 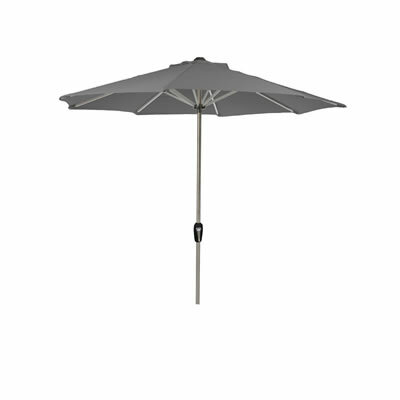 You can also buy parasols that are made from the same high grade material as the furniture itself, which will allow you to sit out in the sun while enjoying protection from the heat. 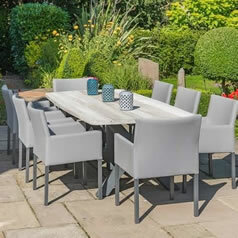 At Garden Furniture World we stock a whole host of garden furniture, accessories, and other equipment. 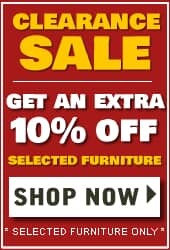 Garden Furniture World has a large stock of products as part of our LeisureGrow garden furniture sale. Choose sets according to the number of seats you need, the materials that products are made from, and the features that are offered. Visit Dawson's Department Store to discuss your garden furniture needs, call one of our friendly and knowledgeable team, or buy through our secure online shopping cart. 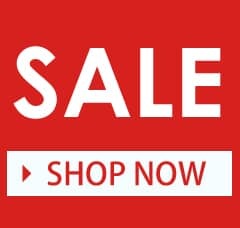 If you spend more than �100, you receive free delivery on your items, and you can enjoy competitive prices on some of the best looking furniture benefiting from the most recent trends.